The PlasmaJet&reg; is an innovative device used to coagulate bleeding tissue during surgery. "MLE possess a remarkable technical ability; they are brilliant at understanding a brief and are very passionate and sincere about providing a good result. We would recommend them to anyone and wouldn’t dream of going elsewhere," Peter Gibson, Plasma Surgical. A plasma is a high-energy gas which readily gives up its energy as heat and light. Gas plasmas have been used for many years in a variety of applications, from cutting metals to rocket engines used to position satellites in space. 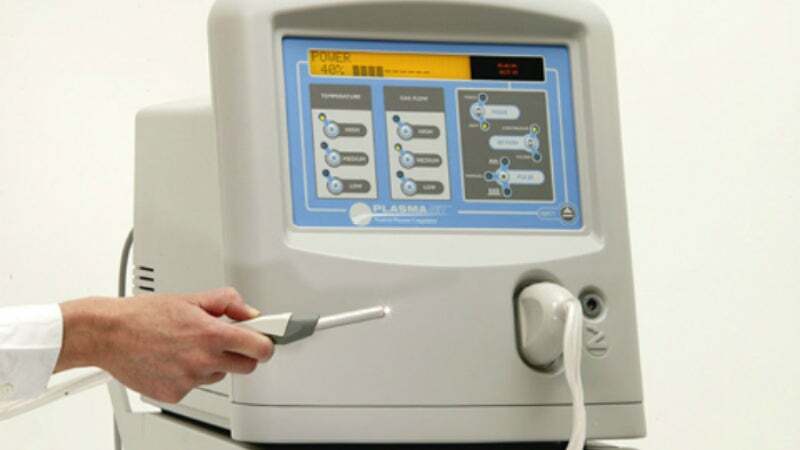 Plasma Surgical was founded in 1999 with the objective to advance the surgical application of a unique patented neutral plasma technology which stems from over a decade of original work carried out by Professor Nikolay Suslov (Professor of Thermal and Molecular Physics at the Moscow Institute of Science and Technology) and his colleagues. Present methods of coagulating tissue during surgery are based upon the long established technique of electro-surgery. However, this rather old technology employs a series of sparks to generate heat, and has the drawbacks that it uses a high voltage and patients are exposed to electric currents during surgery. Plasma Surgical realised that they could use the electrically-neutral plasma technology as a safe and precise means of coagulation, eliminating the need to pass an electric current through the patient. Thus the project to develop a machine that could generate and control a jet of plasma suitable for medical use, the PlasmaJet®, was born. Plasma Surgical first came to MLE as they knew the company had core skills in power supply design, with two of the country’s leading power supply engineers working within the MLE design team. Plasma Surgical also knew that MLE had extensive capabilities in embedded control and PIC processors. MLE distinguished themselves from any other electronics design house as they were able to understand and translate general scientific and engineering principles, enabling them to level with Plasma Surgical’s Russian scientist, speaking the language of gas physics, as the project moved forward. Understanding the principles upon which any gadget is based means that MLE were able to break down Plasma’s ideas and suggest many different options for achieving their objectives. PlasmaJet’s® specification today is very different to its original one, having evolved considerably over the two-year project. MLE’s involvement is a classic example of engineering development, with MLE responding immediately and intelligently as Plasma Surgical explored what they wanted. The PlasmaJet® contains numerous technical complexities that have to work together without interfering with one other and it is the combining of these to create a coherent whole that makes the PlasmaJet® so special. The PlasmaJet® is an innovative device used to coagulate bleeding tissue during surgery. The technology uses a jet of argon plasma to provide fast and precise control of bleeding, leaving a wound sealed. It can be used during both conventional and laparoscopic (keyhole) surgery, greatly reducing the risk and duration of complex procedures and can minimise costs by reducing the patient’s stay in hospital. The PlasmaJet® needed to have a low EMC emissions profile, vital for medical products. MLE were able to design for this and used specialised techniques to create a very clever power supply for the PlasmaJet®, which was compliant with all the latest regulations and international specifications and was in turn universal, meaning that the machine can be plugged in anywhere in the world. The PlasmaJet® handpiece generates a gas jet at very high temperature, so it is not surprising that the internal electrodes need water-cooling. To prevent damage to the handpiece, the design (prior to working with MLE) made use of a mechanical flow switch, which blocked the plasma jet if water flow was insufficient. During discussions with MLE it was decided to make the waterflow adjustable, which would allow for future product developments. MLE created a very simple waterflow sensor based on an analogue pressure transducer. This has no moving parts and allows an appropriate critical flow setting to be created in software specifically for the PlasmaJet® handpiece, but which can be adapted for any product variations. The waterflow sensor was suggested by MLE as an alternative to an expensive off-the-shelf item and the original mechanical flow switch. The PlasmaJet® console contains three embedded processors; the largest is responsible for the user interface, controls, indicators and the control of plasma generation. The power supply has two smaller processors, one controlling the mains side sequencing and the other controlling the temperature and ignition of the plasma. As PlasmaJet® moves into production to meet worldwide demand, MLE are continuing to work with Plasma Surgical through offering supported manufacture. The PlasmaJet® design is so complex, with so many components, that it will continue to need support throughout its life, with requirements for upgrades, repairs and design changes to overcome component obsolescence. MLE are looking forward to a future where they are responsible for nurturing its future design and ensuring an uninterrupted supply of this very exciting product. MLE has worked with Plasma Surgical to take their original concept for the PlasmaJet® and make it suitable for commercial implementation. MLE has provided close support to Plasma Surgical, which has allowed the company to obtain FDA approval for the PlasmaJet®. In clinical trials the PlasmaJet® has already contributed to successful operations on over 170 patients, many of whom were able to leave hospital several days earlier than expected. The end result of Plasma Surgical and MLE’s work is a groundbreaking product that can be used anywhere in the world and is already making waves in the medical industry. Now approved by the FDA, the Society of Laparoendoscopic Surgeons awarded the PlasmaJet® with the Innovation of the Year Award for 2008; it is also considered as one of the most significant new products at the American College of Surgeons and MLE are proud to have contributed to its success.